Situated near the beach, this hotel is 10.2 mi (16.4 km) from Den Tapre Landsoldat. Borkop Brejning Station is 23 minutes by foot. Where to find Borkop hotels near an airport? Where can I find hotels in Borkop that are near tourist attractions? Are you arranging to spend some nights in Vejle? Hoping to find a place to stay in or near Borkop? Borkop offers 4 accommodation options within easy driving distance of the downtown area. 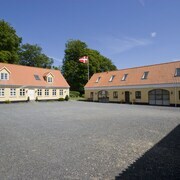 You'll find Comwell Kellers Park and Munkebjerg Bed & Breakfast within walking distance from Borkop's center. The Scandic Jacob Gade is located 10 kilometres (6 miles) from downtown Borkop. Or, alternatively, the Hotel Koldingfjord is 19 kilometres (12 miles) away. Another possibility is to book a room at the Comwell Kongebrogaarden or the Fænø Sund. Fredericia is 12 kilometres (7 miles) to the southeast of Borkop and is where you'll find Trinitatis Kirke and Den Tapre Landsoldat. The Best Western Hotel Fredericia and Hotel Gammel Havn are just some of the great hotel alternatives in Fredericia. 20 kilometres (14 miles) to the southwest of Borkop, you can also stay at Kolding, home to the Scandic Kolding and Kolding Hotel Apartments. Should you choose to stay in Kolding, a couple of places to add to your itinerary are the Koldinghus and Geografisk Have. Before your Borkop trip comes to an end, why not spend an hour or two rubbing shoulders with Vejle sports enthusiasts at a local game. NRGi Arena is 65 kilometres (39 miles) to the northeast of Borkop. For travelers who are keen on booking accommodation nearby, make a reservation in the Hotel Royal or Scandic Aarhus City. For travelers planning on arriving or departing through Billund Airport, you can book some accommodation at Hotel LEGOLAND, or Lalandia Resort Billund, which are both conveniently close. 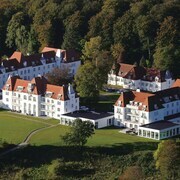 What are the most popular Borkop hotels? Are there hotels in other cities near Borkop? What other types of accommodations are available in Borkop? Explore Borkop with Expedia.ca’s Travel Guides to find the best flights, cars, holiday packages and more!